This was my first Smart Trainer, so I didn't know what to expect. It's sturdy and the Rock and Roll movement feature definitely adds to the realism, making it feel more like an outdoors ride. The first thing I noticed taking it out of the box is how robust and sturdy it is, the frame and especially the flywheel is heavy and the roller and bearings fees very smooth. It has been reliable so far (a few months of hard training rides). 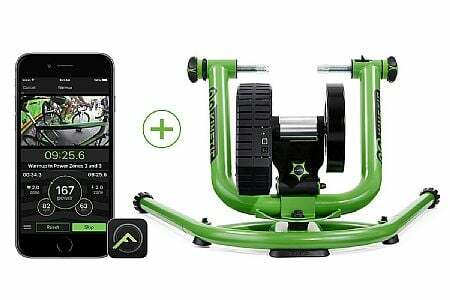 To get the full benefit, you'll probably want to join Zwift, have a smart phone and also get the Kinetic turntable riser ring so you can swing the handlebars back and forth freely. Other important items for your pain cave are a high powered fan and a trainer mat to soak up the sweat. There are a few important things to watch out for. Some of the issues were with the trainer and some were with getting set up with Zwift. The first is that the cone cups on the unit can damage your frame when used with the included Kinetic QR skewer. I have a Cannondale Synapse alloy bike and the dropout curvature is very tight. The cone cups pressed directly on the inside curvature of the dropouts and scratched them, rather then fitting around the ends of the Kinetic QR skewer without contacting the frame. This is tricky because you can't easily see it's happening. The only clue I had was a slight squeaking noise when riding. I advise mounting your bike into the cone cups very carefully the first time you use it. Check the interface between the cone cups, skewer ends and dropouts carefully with a flashlight and don't tighten it much. You should see daylight between the cone cup and the dropout surface, with contact only between the cone cup and the skewer end but not the frame! If this is not the case, stop now and get help from Kinetic before you scratch your dropouts like I did. It turns out Cannondale makes a long Trainer QR skewer with spacers to fix exactly this problem. The spacers push out the skewer ends so the cone cups will only contact the ends of the skewer and not the frame. Bottom line if you have a Cannondale you will probably have this problem, buy the inexpensive Cannondale trainer skewer. The next problem is your bike may lean a little to one side when it is mounted on the trainer as the instructions say to (centered on the roller). This was very annoying because I had to lean my body the other way to feel right, unacceptable. The fix is simple just move the bike to one side on the roller to counteract the lean, and reset the mounting point. This fixed the problem for me. With the above problems fixed, the bike feels very secure, quietsqueak free, and stable when mounted. I can get up out of the saddle and do a 600 watt sprint all out (hopefully you can do better!) and have no fear of falling over or the bike coming off the trainer. And you can really swing the bike back and forth and the handlebars too (as long as you have the Kinetic turntable riser ring). It's very realistic, cool, and unique. OK, now onto the software and pairing issues. I pair my trainer with a Mac. I can Bluetooth-pair the trainer either with my phone or with Zwift on my Mac, but not both at the same time. This is a limitation of Bluetooth Low Energy (BLE). You have to first pair the trainer with your phone, warm up for ten minutes and then do a calibration using Kinetic's app on your phone. This adds ten minutes to my workouts. If you don't do the warmup and calibration, you will get very inaccurate power readings. After the calibration is done I have to exit the Kinetic app on my phone and then pair it with Zwift running on my Mac. I'm not sure exactly how this works if you are using the Zwift bridge app on your phone instead of pairing directly with your gaming machine. OK so this is my third review on the Rock and Roll Smart Control trainer this year. Turns out the latest firmware update fixed the issues with inaccurately reported power drops and spikes. And I'm getting very consistent calibrations now that I have the tire pressure (100 PSI) and roller tension (3 14 turns) just right. Getting the tire pressure and roller tension correct so you get the right spin-down time applies to pretty much all wheel-on trainers. This will give you accuracy in your watt readings. It also helps to buy a trainer-specific tire and clean it and the roller with isopropyl alcohol regularly so you get a good sticky surface on the tire to press against the roller. The bottom line is, if you know what to do you will get consistency and accuracy in your watt readings...but it isn't obvious how to get it right until you get some experience and know what the configuration details should be for this trainer. Now that the unit is problem-free I'm really enjoying the immersive feel of the rock and roll side-to-side swing feature. Plus it's comfortable to ride because you can change positions a little more like riding in real life. Some people who ride direct-drive trainers say that they aren't very comfortable because of the lack of movement, but the Kinetic definitely helps with this. All in all, I'm satisfied with the Kinetic trainer and plan to hammer on it and keep it for years to come. For tips on how to set up the trainer for best results, check out the Kinetic Riders group in Facebook. After using the Kinetic Rock and Roll Smart Control trainer for several months, I want to update my original review. It's still a sturdy and robust trainer, but with some experience I see that the watt readings can vary a lot depending on setup. I was happy to see my FTP increase 40 watts over the season, but I recently discovered the trainer was overestimating my watts (by a lot) because I didn't have the tire roller tightened down enough. I found out from Kinetic tech support that you should have a spin-down (calibration) time of 6-8 seconds with this trainer, but I was getting 13-16 second spin-downs. The tire wasn't slipping during workouts and the calibration succeeded so I assumed all was good. But now that I have the spin-down time to where it should be, the watt readings have dropped precipitously. If I de-tension the tire roller a little my watts go back up. This is not a good thing if you want accurate and repeatable workouts. In addition, after the latest firmware update I am getting occasional random spikes down to nearly zero watts then back up to 300 watts, when I am really putting out a constant 190-210 watts. This happens several times during a workout. I spoke with Kinetic tech support about this and their answer is that they are getting accurate watt graphs in their testing, and it's hard to get the watts to read correctly with different software (Zwift, TrainerRoad etc). I showed them the much more consistent watt graphs I was getting before the firmware update, but they didn't comment on that. It makes the trainer less fun to use because I get constant over or under watt target warnings from Zwift and I get get dropped pretty fast in Zwift if the spike to zero lasts very long. On the upside, the trainer continues to pair with my computer running Zwift without incident (which many people complain about on other trainers). And it's still a sturdy and robust trainer built to last. All in all though, I would spend the extra money to buy a direct drive trainer if I were to do it over again. That way you don't have problems with tire tension and other issues causing inaccuracy.